Office decorating for Christmas can be easy when you first decide on a festive theme. You can choose various decor accents for each space in the office and ensure it is cohesive with themed colors, styles and decorations. Greenery is popular at Christmas. This includes Christmas trees, garland, wreaths and centerpieces. There are many ways you can use this theme in an office space. You can use more than one Christmas tree in a large office. 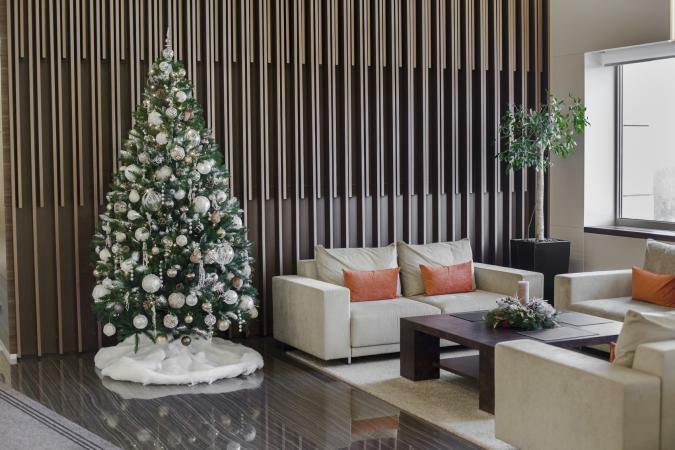 In fact, if your office has expansive hallways or more than one reception area, you can play up this architectural feature by decorating similar trees throughout. Decorate trees identically for a consistent look. Hold a tree decorating contest based on this theme. This can be competition between departments or employees divided into teams. Use different decorations for each tree, keeping the theme of red and gold. One tree can use only gold mini-lights, another with red lights and a third with green lights. You may prefer that all trees have the same colored lights or use a mixture of all three colors. You can be creative when deciding where to place wreaths. For example, you can place them on the main columns of the second floor. This gives a great visual, especially if you augment with complementary garland along the upper floor railing or wall. Place wreaths and garlands throughout the entire office. Hang a wreath on the wall behind the receptionist desk/center. Place a wreath or several smaller ones on the break/lunch room walls. Small wreaths on bathroom doors add a tiny touch of Christmas cheer. Conference rooms are ideal for wreaths on an accent wall or door. Frame reception or conference room windows with garland and suspend small- to medium-sized wreaths in each window or spaced evenly across large windows. Don't neglect the outside of your office building or entrance doors within a multi-office building. Wreaths on the doors are a wonderful way to greet all who enter your office. Some companies opt for an extra large outdoor wreath that is secured to the side of the building. If your company sign is on the building, you can center the wreath either above or below the sign. If you have road signage, you may be able to decorate with garland and a wreath, depending on signage regulations within your city. 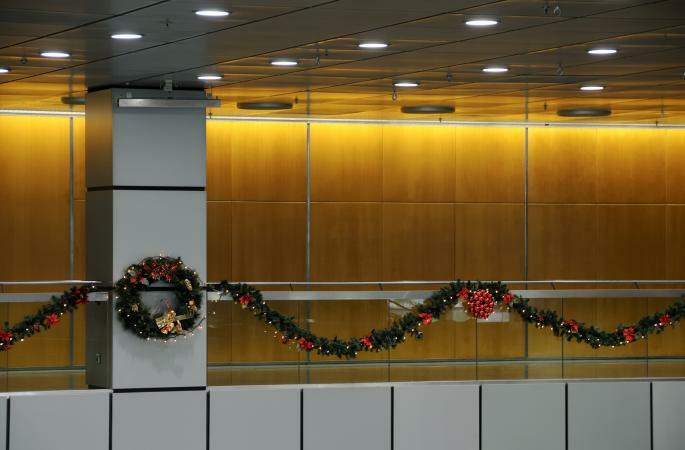 An office building with a curved half-wall entrance area is another great place for garland and possible a wreath or two. Snowflakes are a fun and festive way to decorate an office space. Snowflakes can be suspended as ornaments on a tree or if lightweight suspended from the ceiling or walls for an extra sense of magic. You may wish to spend more time and even money on the decorations for the reception area since this is the first interior space of your office that customers and others will see. 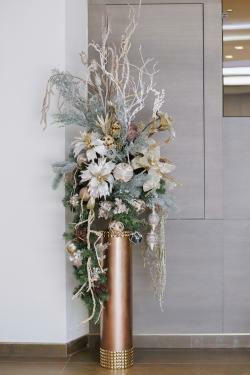 Place an artificial small tree in a gold or bronze colored urn on or in the reception desk area. Use large to small white and red snowflakes a tree ornaments. String red beaded garland around the tree. Top with a finial or a large snowflake. Wrap boxes of different sizes in coordinated Christmas paper complete with bows. If the desk has an overhang or ledge/shelf, hang a few red and white snowflakes from it. Include a snowflake patterned bowl to hold small candy canes for customers/clients. Besides the reception area, you can repeat this design theme in individual offices, conference rooms, cubicles and other spaces. Select specific areas or corners to create a gift console table or simply suspend red and white snowflakes from the ceiling. Make these various lengths to create greater interest. 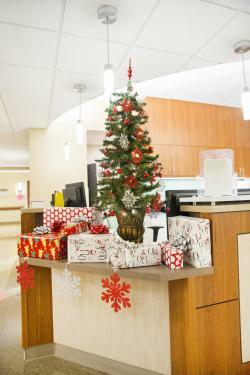 You may decide to add a few tabletop Christmas trees decorated to mimic the vignette in the reception area. Decorating an office space, especially an open office space can present some challenges, especially when you wish to create a uniform Christmas design. Consider using a tinsel theme that will encapsulate the holiday spirit. Use more than one color of tinsel. Consider incorporating one color from the previous room into the next to tie every room together. 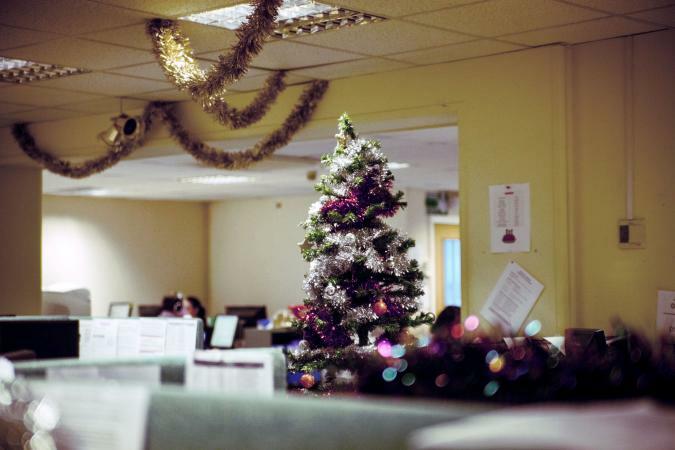 Most offices have suspended ceilings, which make it easy to lift the tile to string tinsel garlands overhead. Use large, thick, golden tinsel garlands for dramatic ceiling swags. Add pairs of large gold bells for a bigger statement. Any Christmas trees used in the office can feature a different color of tinsel. Use two or three different tinsel colors on the tree, such as silver and blue or blue, white, and pink. Continue the tinsel theme by draping tinsel garlands along the outer walls of cubicles and doorways. Suspend tinsel stars from the ceiling and along walls for a fun touch! Tinsel works in every room, from your open office concept to conference rooms to reception spaces. The use of winter white for your office decorating theme can be enhanced with splashes of gold colors. Use all types of decorations in different values of white to give this theme added depth. Make a grand statement with a bold winter floor arrangement that can be placed outside your office entrance or in a corner of a reception area or conference room. This type of arrangement might be ideal for the president's office or the entrance to a specific department within your company building. Commandeer an umbrella stand or cigarette caddy and wrap in gold or bronze gift paper. Choose a matching textured paper for a bottom border. Drape a garland or pine swag down one side of the umbrella stand. Add long sprigs of pine. Spray paint the pine white for wintry, icy effect. Select several twigs and paint white. Add straw flowers and various white silk blooms. Use picks of fruit that are glazed to resemble ice and snow. Hang several large white and gold/bronze Christmas balls and finials. 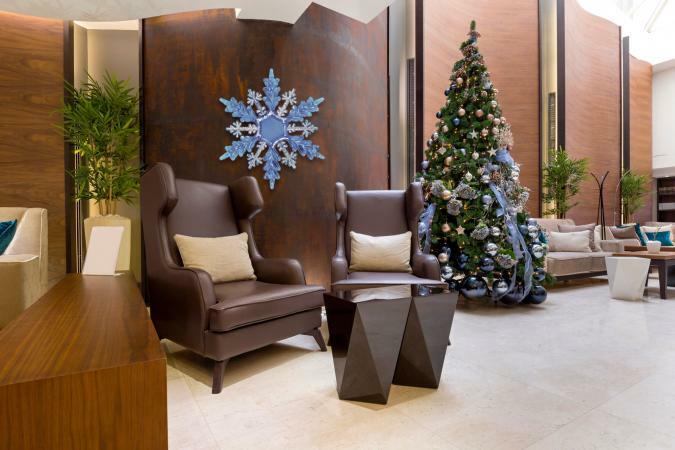 A wintery white Christmas tree dresses up your reception area, employee lounge, or any shared space where it fits. Use cotton batting for the tree skirt. Large white and white/silver ornament balls should be placed throughout the tree. Strings of white beads can be cut 6"-8" long and hung vertically from branches. Pine cone sprigs can be painted white or sprayed with faux snow. Paint just the tips of cones. A traditional candle centerpiece can be upcycled for this theme by add various floral picks of white fillers, such as berries, baby's breath, feathers, and other fillers. You can also purchase or create a different type of winter white centerpiece. Add small matching ball ornaments to a candle centerpiece for an adorable look that carries the winter white theme to the sitting area or conference table. Break with traditional colors and go for a blue Christmas decoration theme! This dramatic tree is created with several stunning ornaments and artificial flowers. The tree is decorated as though the lower half is a ball gown. As with any tree, you can place it in the reception area, employee lounge, conference room, or long hallway. Silk blue hydrangea sprigs can be added within the tree boughs. Gauzy blue ribbon streams cascade down the trees and are tucked underneath the lower ornaments. Blue ornament balls of various blues feature the smallest placed at the top and growing in size as they move down the tree. The bottom of the tree supports extraordinarily large balls that dangle above the floor. Silver balls and stars are used as well as bronze and gold ball ornaments. Add a dramatic touch to your blue themed reception area with an oversized delicate snowflake or star design in blue and silver. Trace a snowflake or star pattern onto a thin foam sheet. Cut out the shape using an X-Acto knife. Use spray paints to create the silver and blue design you desire. Add glitter if desired. Hang your creation on the wall near the tree. This snowflake adds a great focal point as a backdrop to the Christmas tree and carries the blue Christmas theme beyond the tree. Toss in a few blue pillows for the reception sitting area and you have an elegantly decorated office space. Then make several additional snowflakes to place in hallways, on doorways, and in the break room to continue your theme. 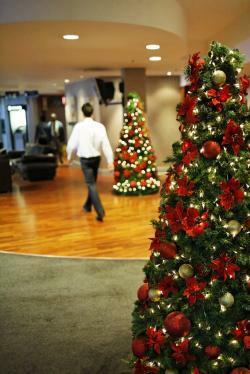 Choose a Christmas theme for your office and make it count by carrying the theme throughout your office space. Don't neglect small areas, such as a coffee station or restroom area. Make it festive and you may be surprised that your employees enjoy their work days a little more.